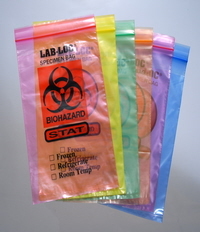 Assorted Colors Bio-Hazard Specimen Transfer Bag Re-Sealable Baggies. Sizes are Width by Height and the measurements do not include the Re-Sealable or lip on top. Please note that all quantities contain an "ASSORTMENT".